Any plant of the genus Helianthus, so called probably from the form and color of its floral head, having the form of a large disk surrounded by yellow ray flowers. The commonly cultivated species, Helianthus annuus, a native of America. A bright yellow, like that of the flower petals. sunflower on Integrated Taxonomic Information System. 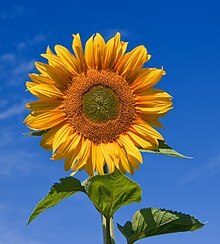 Sunflower (Helianthus annuus) is an annual plant native to the Americas that possesses a large inflorescence (flowering head). The sunflower got its name from its huge, fiery blooms, whose shape and image is often used to depict the sun. The sunflower has a rough, hairy stem, broad, coarsely toothed, rough leaves and circular heads of flowers. The heads consist of 1,000-2,000 individual flowers joined together by a receptacle base.